My experiment with hatched planes yesterday had a secondary goal in mind, I've always had problems with connectors and V1 boards. The problem is unreliability in the connection do to the forces generated in using the connectors. I always had to make sure I still had the voltage at the ICs on the board because I could never be sure that the connector solder joints were holding. Even with hot gluing the connector to the board. Maybe my annular rings are too small but I decided that even if I don't "need" a hatched plane I will still use one for each pin of a connector. I use the plane as an additional annular ring where space allows and just walk the solder holding the connector out as far as I can. The board I created yesterday with the hatched planes took longer than all the boards Ive ever created to make but, for the first time I didn't feel like I was fighting with the board itself to run my tests. That's really clever - would you mind positing a picture of the connector with hatch plane 'anchoring'? If this works well, we could update the design recommendations to include your approach! finally I realized to just crop the image and it uploaded easy enough. Really cool approach! Did you feel much more comfortable with the joint strength with this method? for the first time I didn't feel like I was fighting with the board itself to run my tests. I'm confused if you answered your own question with my original post lol. 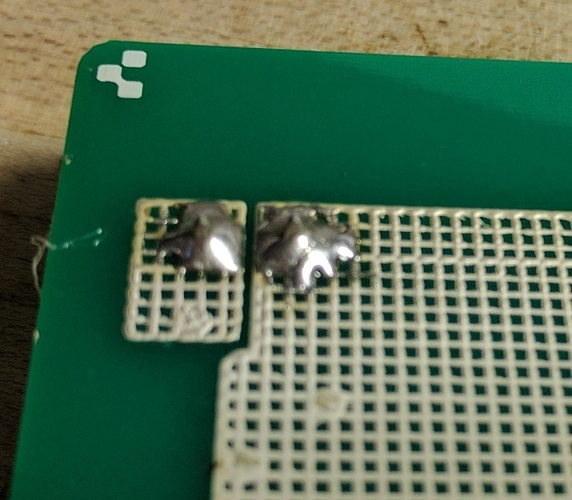 The answer though is yes, with the new solder and hatched planes I don't feel like I'm ripping the solder off the pads when I plug in connectors anymore.